Following on from our WWI project, participants were keen to continue researching Invergordon's past and a new project began. Weekly sessions began in 2016 run by ARCH on behalf of Invergordon Museum and funded by the Heritage Lottery Fund and Beinn Tharsuinn Community Benefit fund, to investigate the impact of World War II on Invergordon. 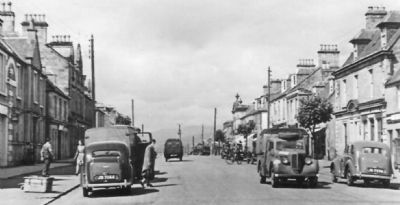 Invergordon was no less busy in World War II, but the focus was very different. We spoke to local residents with memories of the war years, looked at archive information, aerial photographs, old photographs and other sources. During the last few sessions we gathered our findings and created a new display within the museum which was opened as part of 2016 Highland Archaeology Festival. Binders with further information have been deposited in Invergordon Library and with both primary schools. Much more research material is gathered in folders at Invergordon Museum alongside our new display. 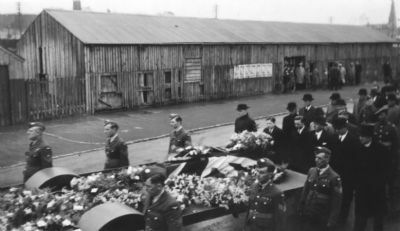 Wartime memories and information about the war graves at Ross-keen have been added to our website, see separate War Graves page and Library. Details about nearly 800 sites have also been submitted to online heritage databases: the Highland HER and Canmore. With so much interesting information gathered we went on to produce a booklet 'Warime Invergordon - a town transformed'. Illustrated with many photographs from the museum’s archives, it also included newly discovered information and photos. Come along to see what we discovered. We also encourage anyone with memories or photographs of Invergordon in World War II to look at our display and add their information to our records.